Our coverage of the 2018 Dirty Kanza 200 is brought to you in part by Panaracer. Check out their line of gravel tires for your next adventure. Since retiring from cyclocross after the 2015-16 season, Sven Nys has been busy taking on fun cycling challenges. He raced the 2016 SSCXWC as one “Stan Nice,” and then took on the 2017 Cape Epic along with fellow Sven Sven Vanthourenhout. We also saw him put on a show in a Cat 4 race in Chicago at the beginning of last cyclocross season. 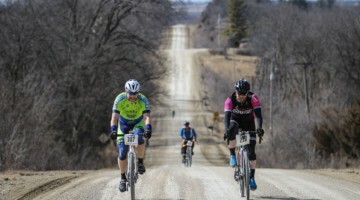 Next up for Nys appears to be the Dirty Kanza 200 gravel race in Kansas on June 2. Earlier this week, Nys posted a photo of his new Trek Checkpoint gravel bike outfitted with Challenge gravel tires on social media. The Dirty Kanza just posted start lists for the June 2 race, and there in the Men 40-44 category is one Stanley Nice of Waterloo, Wisconsin. Nice will join a number of other cyclocrossers at the 2018 event, including Kaitie Keough, Michael van den Ham, Craig Richey and more. Cyclocross Magazine will be at this year’s DK200, so stay tuned for more coverage.